Normally I'd think of the content here as more of a review, but since boots for small feet can be really hard to find, I wanted to put this where it might potentially reach more of the target audience. In general, although my US shoe size can vary wildly, shoes sized Euro 37 or 37.5 have never not fit me. 38s are "normally" already too big. Although Sidi is said by many to run narrow, these size "38" Alpinestars feel like they're the same size as my size 37 broken-in (but also not leather) Sidis. For those trying to guess how they might fit a "Youth," the height in back from where the boot attaches to the sole to the top of the boot is just over 13 inches. Front extends a little bit higher. Top buckle strap can be made much longer than either of the two lower straps (It's easier to pull out when the boot's not on your foot. ), but I hope I never have to replace the top one, because I can't see a way to get at the back of it like for the bottom two. These boots are not made of any leather. Regarding comfort, I can't really say yet, because I've only had them on for a couple of hours indoors so far. I also can't comment on functionality, because it will be my first time riding in the dirt, and the one time I rode a supermoto I was wearing my Sidi ST's. "The thing that squicks me out about wearing these types of boots is how floppy they are when it comes to ankle protection. All crashes are different, of course, but I broke my ankle in a very low-speed crash in a supermoto race in boots just like those. The availability of small-footed boots comes and goes, and right now there are two models in small sizes with protection I feel good about. 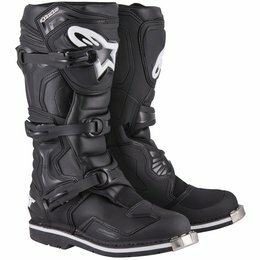 The Alpinestars SMX-plus has about the least amount of ankle protection I'd be comfortable with, but are comfy for all-day wear and are available down to Size 36. Those are my daily boots (I wear a separate pair of SMX-plus in the dirt), and my track boots are Dainese Torque Out Lady, which also go down to 36."